About a month ago, I was pondering a way to make snazzy spell tokens to use while playing Dragon Dice. Many of the spells in the game have a once-off effect, but many others linger for a full game turn or longer. I know some players keep a pad of little sticky notes to use for marking the lingering spells. But I prefer something more sparkly for such duties ^,^ And then one day in my local big-box craft store, I spotted a Shrinky Dink machine marked way down on sale — Eureka! This would work nicely for making custom tokens for Dragon Dice, and other tokens for Chibi dungeoning. The machine has a small heating element which fires up quickly. It’s great to use for colour tests and prototyping. For doing full production, firing up the kitchen oven is the way to do big runs. 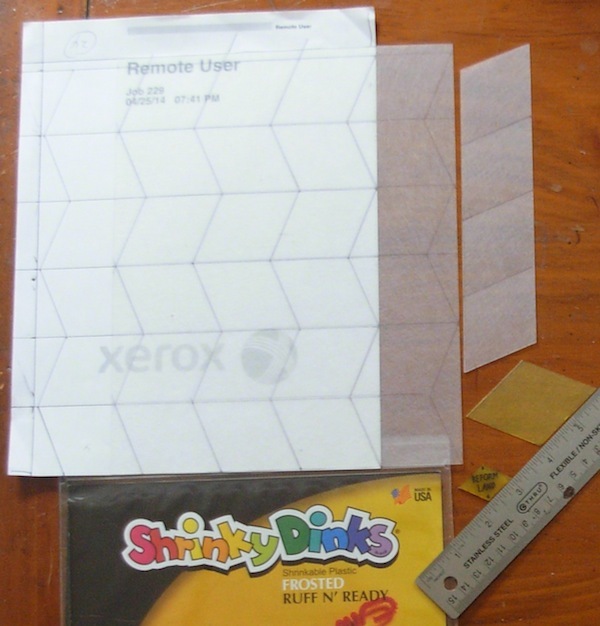 It also came with a few small sheets of the Shrinky Dinks Frosted Rough N Ready plastic. I also picked up a pack of larger sheets of shrink plastic of another brand. Initial testing showed that the off-brand plastic did not shrink and shape nearly as well as the official brand. I’ld name names — but it was so bad, I threw the whole package away and don’t actually recall the brand. I then hunted down packs of the actual Shrinky Dink material. The Frosted Rough N Ready plastic colours up very nicely! First step was testing various colour markers to use. When the plastic shrinks, the colours are deeply intensified. So standard marker colours come out way to dark to read any writing on them. After a fair amount of testing, I wound up using a couple of different brands of markers. Coloured the edges of each token as well as the top surface. The Prismacolor markers worked best. Either the brush- or chisel-tip work fine. I used the Cool Grey 30% and Apple Green. None of the local stores had the full range of red and blue shades though, and I couldn’t find one of those that was light enough. (True Blue and Copenhagen Blue darken too much, and Light Cerulean Blue is too greyish for me). For the last two colours, the best shades I found were Tombow at the local Blick Art store, 493 Blue and 885 Red. These are water-based markers though, and the much of the colour rubs off onto your fingers from the plastic unless you wear a latex glove on the hand you use to handle the plastic while drawing or setting them up on a sheet for baking. For lettering, I mostly used a Sharpie Fine point; and a Micron Art .05 just for lettering any specific army race code. 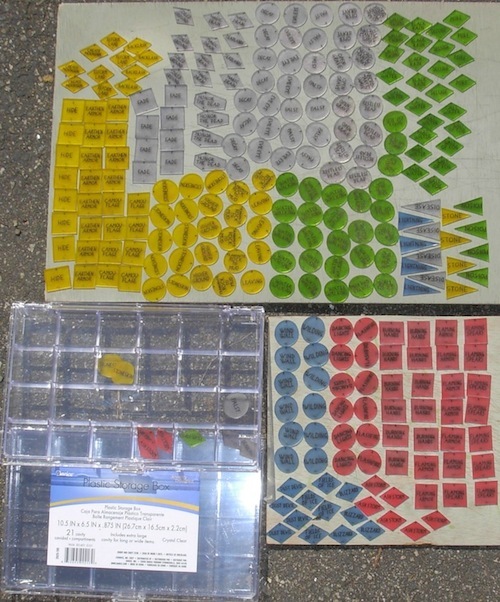 For cutting up the plastic sheets, I drew out the grid for the lozenge and square tokens on a sheet of scrap paper. Then put the plastic over this and traced the lines on each sheet, then cut them apart with an XActo and a steel ruler. For the Dragon Dice tokens, I cut different shapes to show the type of target the spell is cast on. 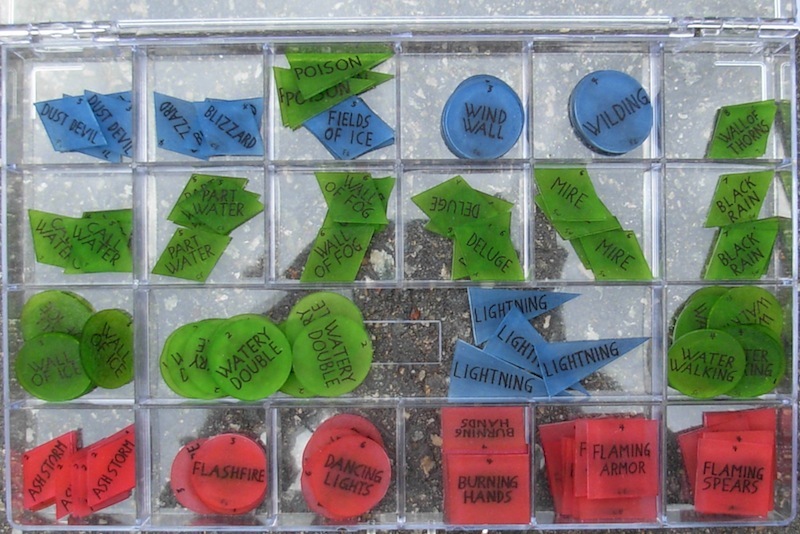 3″ x 2″ lozenges target a Terrain. 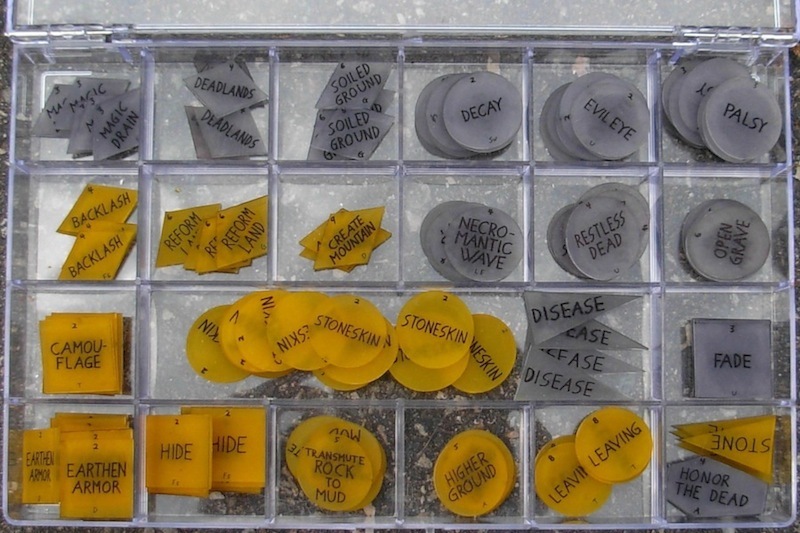 2-1/2″ circles target an Army. 2-3/8 squares target a Unit. A coffin-shaped one for the one spell that targets the Dead Unit Area. And long triangles for lingering Army effects of Dragon breath attacks. The lettering I block printed on a sheet of graph paper first, then traced each token over that. There’s a small font number at the top of each spell token that shows the casting cost of the spell. And if a spell is unique to a particular race, there’s a small font letter code on the bottom of the token. The Yellow, Grey, and Green tokens were coloured first and then lettered. Because early tests of the Blue and Red showed the colour rubbed off onto my fingers when handled, I lettered those first and then coloured them. Early tests also showed that the Black Sharpie for the lettering smeared when coloured over. So, I let the lettering dry overnight (or longer) before colouring. Unfortunately, while there was no visible sign of the dried-Sharpie letters smearing, the tokens that I did that way did come out greyer after being shrunk than the initial test ones with lettering on top of the colour. Grr. If I do this again and must use a water-based marker: wear glove, colour first, then letter. For big-batch shrinking, I baked these on cookie sheets lined with parchment paper. Depending on the different shapes, 4–6 minutes baked at 350 degrees F did the trick. Smooshed them flat with a spatula while they were still warm and soft. If some of them didn’t look completely shrunk or weren’t quite flat, I tossed them back in for another 2 minutes baking and another smooshing.